Cookies can be “persistent” or “session” cookies. Persistent cookies remain on your personal computer or mobile device when you go offline. Session cookies are deleted as soon as you close your web browser. When you use and access the Service, we may place cookie files in your web browser. In addition to our cookies, we may also use various third-parties cookies to report usage statistics of the Service, deliver advertisements on and through the Service, and so on. DaveCrenshaw.com is not affiliated with or endorsed by lynda.com, Inc. Yes! 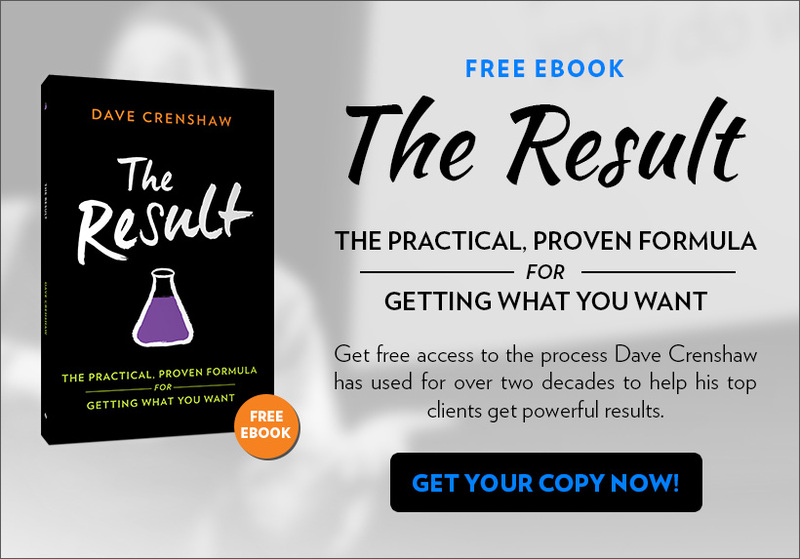 I want to download "The Result: The Proven, Practical Formula for Getting What You Want" for FREE! This form collects information we will use to send you weekly training tips. We will not share or sell your personal information. You can unsubscribe at any time. Yes, I would also like to receive weekly productive leadership tips from Dave.